Swipe konnect 4G has a 4-inch FWVG display, powered by a 1.5GHz quad-core processor with 512 MB of RAM. It comes with 4GB of internal storage which can be expanded upto 32GB using a microSD card, a 5 mp rear camera with LED flash and a 1.3 mp front shooter and is backed by a 2,000 MAh battery. Zen Admire Thrill is powered by 1.3GHz quad-core processor paired with 1GB of RAM, 8GB ROM expandable upto 32GB via a microSD. This phone runs on Android 6.0 Marshmallow and features a 4.5 inch display, 5 mp rear camera and 2 mp front camera, this phone is backed by a 1,750 mAh battery. This phone comes with a 4-inch display, runs on 1.3GHz quad-core processor, 1GB RAM, 8GB internal storage. It runs on android 6.0 Marshmallow operating system, a 5 mp rear camera, 2 mp front camera and is backed by a 1,800 mAh battery. Micromax Canvas Spark has a 5-inch FWVGA display, powered by a 1.3GHz quad-core spreadtrum processor coupled with 1GB of RAM, 8GB of internal storage expandable upto 32GB via a microSD card. It features a 5 mp rear camera with LED flash and a 2 mp front shooter and is backed by a 2,000 mAh battery. Reliance Lyf Wind 7i from Reliance Jio has a 5-inch HD screen, powered by a quad-core Qualcomm snapdragon 210 processor, 1GB RAM, 8GB ROM expandable upto 128GB. It runs on Android 6.0 Marshmallow, 8mp rear camera, 5mp front camera and is backed by a 2,350 mAh battery. Xolo Era 2 has a 5-inch display, powered by a 1.3GHz quad-core processor. It runs on Android 6.0 Marshmallow OS with 1GB of RAM and 8GB of internal storage expandable upto 128GB. It is backed by a 2,350 mAh battery, 5mp rear camera and front camera. Intex Aqua S2 has a 5-inch display, powered by a 1.2GHz quad-core spredtrum processor. It runs on Android 6.0 Marshmallow OS and comes with 1GB of RAM and 8GB of ROM expandable upto 32GB via a microSD card. Aqua S2 is backed by a 2,450 mAh battery, 5 mp rear and front camera. Alcatel Pixi has a 5-inch display and is powered by a 1GHz quad-core MediaTek processor. 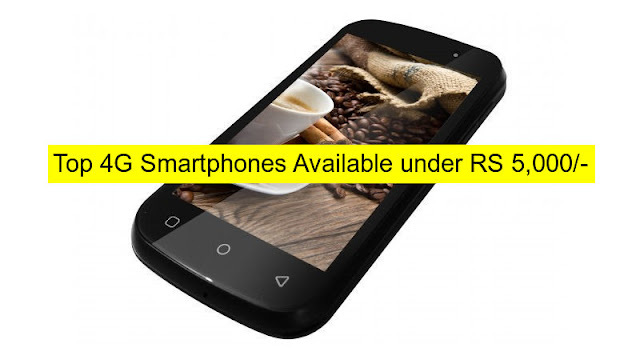 It runs Android quad-core OS and comes with 1GB of RAM and 8GB ROM (expandable upto 32GB). The device is powered by a 2,000 mAh battery, 8 mp rear camera and 5 mp front camera. Swipe Elite 2 Plus is powered by a quad-core processor with 4G VOLTE support. It runs Android 5.1 Lollipop and 1GB of RAM and 8GB ROM (expandable upto 32GB). It is backed by a 2,500 mAh battery, 5mp rear camera and 2mp front camera.